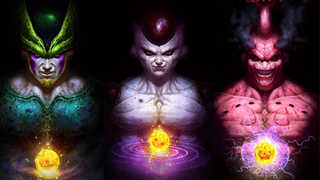 Akira Toriyama's iconic style has defined Dragon Ball and its various spinoff properties for years - but these incredible takes on some of the series most nefarious villains by Chinese artist Angus Yi eschew Toriyama's style in favour of some chilling realism. Angus drew the pictures last year, but the pictures have recently been getting the attention of Dragon Ball fans on the internet, because holy crap look how cool they are! Toriyama's distinct style may be burned into the mind of anime fans the world over, but it's hard to deny just how much creepier the character's look when you give their designs a realistic makeover. That Majin Buu is definitely creeptastic. You can check out a few more posters at the link below.